The public relations manager of Dream nights Mr. Imran Khan while attending the press conference held at Sheikh Zayed Road Dubai said that Dubai Adventure is the most valued online booking platform for Dream Nights Tours LLC. The company has 5 years of experience in the Dubai tourism sector and an influential reputation for producing the best desert safari deals for visitors. He added that their online website provides valuable information about several visitors dream places in Dubai and especially desert safari excursions. The online portal provides booking facility for desert safari deals and city tours. The spokesperson of Dream Nights LLC stated, “We provide various exclusive desert safari deals to suit the budget of the tourists. The most affordable one is the evening desert safari which is famous for its fabulous scenes of the sunset in the desert with Quad biking. Morning desert safari is a day trip best suited for tourists who loves the early sunrise views. Overnight desert safaris allow guests to observe the wonderful Arabian skies in the red sands desert, the tour also includes various entertainment shows". Dream night Tours enjoys best practices in presenting the comprehensive and affordable desert safari Dubai and city tour packages for tourists. Visitors who hope to enjoy genuine Arabian safaris with expert guides and experienced drivers can schedule their bookings through their online portal. 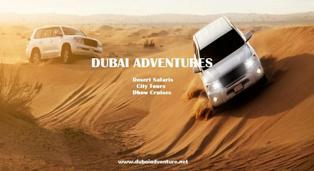 Dream Nights Dubai Adventure offers desert safaris in a variety of combinations. They have an Evening safari, Overnight desert safari, Sharjah safari, and Morning safari tours. They also provide attractive city journeys like Abu Dhabi city tour, Dubai city tour, Dhow cruise dinner in Marina and Creek areas including various other site seeing excursions. Desert safaris are their most famous among the tourists in Dubai because guests want something different to do outside the busy life of the cosmopolitan city and spent some time in Arabian deserts. These safari tours are available in groups for 7 persons on 4x4 Land cruisers, and special discounts are also available for large groups. Their desert safari tour also includes Sand boarding, dune bashing drive, Camel riding, Falcon shows, Horse riding, BBQ dinners, Tanura dance and Belly dance shows. Dream nights Dubai has produced some unique adventure sightseeing and desert safari tours in Dubai. It is a leading travel and tourism organization in Dubai. The team consists of expert drivers and professional support staff and has produced an unparalleled Dune bashing and Camel riding tours. Dubai Adventures wants each moment of the trip a majestic and beautiful experience for their customers.